Just with the name of Assassin’s Creed Odyssey, we’re going to expect a lot from this title. Perhaps the word “odyssey” has been overused throughout time, but since Ubisoft is bringing the term back to where it originated in Ancient Greece, the company is literally saying this will be epic. Have you ever read Homer’s poem (and I mean the POEM, not the prose-form)? It doesn’t take long to see why that’s considered an epic poem, and Odysseus’ incredible ten-year journey only compounds the sentiment. You might say his odyssey was epic. Calling any great journey an odyssey equates to an epic one. I mean, the game starts you on Kephallonia island, which is just south of Ithaca, Odysseus’ island. Coincidence? Ha! I think not. But with all of these promises holding in the Aegean sea wind, does Ubisoft actually deliver? If Homer was still around to recite poetry, I dare say he’d craft another epic called The Misthios (the Greek word for mercenary). It has everything that both Homer and Odysseus himself would approve of, in regards to a great journey: family tragedy, a bit of comedy, plenty of voyaging, mythology, dinner parties, mysteries to solve, and murder. It’s just not a Homeric poem without murder. It doesn’t matter if you pick Alexios or Kassandra, as both of their stories begin rather similarly. A family tragedy forces them to flee Sparta as children, and they end up stranded on the small Greek island of Kephallonia. A man named Markos takes the wayward child in to raise and essentially molds them to be their personal mercenary muscle. It’s no wonder, then, that when Kassandra is old enough to be on her own, she looks for the first opportunity to leave. This opportunity comes from a stranger looking to hire Kassandra specifically. He heard she was an incredible mercenary, whether it was about strong-arming people for the money they owe or killing someone. He is her ticket off of Kephallonia and right into the thick of the Peloponnesian War between Athens and Sparta. Naturally, it doesn’t take long for Kassandra to figure out there’s more to this particular job than she bargained for, and now she’s in the thick of a mystery regarding what truly happened with her family that tragic night and how that relates to a shadowy underground organization trying to tug Greece’s puppet strings. It’s a tale anyone familiar with the Assassin’s Creed games will be well acquainted with, but what sets this one apart is the lack of an Assassin organization. The Brotherhood did not form until 49 BCE, nearly 400 years after Kassandra started her odyssey across the sea. She’s only a simple mercenary, and she’s only doing what she needs to do to find her family. This isn’t another quest for revenge like Ezio, Bayek, or even Connor, and she’s definitely not a groomed Assassin like Altair, Edward, Evie, or Jacob. She’s in this to learn the truth behind her tragedy and make plenty of money in the process. If it means taking down this shadowy group to find out what she needs to know, so be it. They also kind of seem like bad people, and she doesn’t like the idea of them running Greece. That last sentence above? That’s how my Kassandra operates. Sure, she’s a mercenary, but she knows how to help people too and she knows how to distinguish right from wrong. However, I could also play her as a complete selfish prick who will take as much money as she can from anyone and everyone, rob everyone, always resort to violence to settle a conflict, and generally be cruel to everyone she meets. Does how I play her change the overall plot of the story? Not really, no, but it changes my personal responses to things. Depending upon how she answers questions or responds to situations, she can open up different sidequests and even romance options. In fact, Kassandra faces a lot of choices throughout the main quest and sidequests. 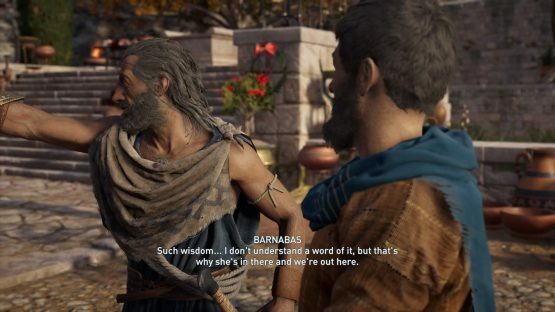 The sidequest choices, as I said earlier, can unlock new missions or romances, but some of them can profoundly affect the world of Assassin’s Creed Odyssey. For example, I took on one sidequest very early in the game that forced me to choose between killing a whole family, including their children, to potentially stop a plague or let them go and risk exposing Kephallonia to the illness. I sat with that choice screen for at least two minutes. What if they did have the plague? Killing them would be the only way to stop it. But if they didn’t, could I really live with myself? Also, could I let my character kill a child? My personal mother instincts jumped in and I let them go (and thus killed the priests trying to kill them). Later in the game, I received word that Kephallonia was besieged with the plague and everyone was dying. Oh, how that weighed on me. I couldn’t kill one child, and now how many children are dying because of it? In the words of Marty McFly, it was pretty heavy, doc. Choices in the main quest can present different rewards, and a few will open up different branches near the end. No matter how you choose, realize that this is a Greek tragedy, and therefore, you will have a rollercoaster of emotions. Before you can even pick if you want to play as Alexios or Kassandra, you have two other big choices to make. The first is game difficulty, of course. The second, however, presents a brand new mode to experience the world of Assassin’s Creed. You’re offered to play either the Guided Mode or Exploration Mode. The Guided Mode is what all previous AC titles have had, meaning that when you receive a mission, markers will magically appear on your map. The game wants you to pick Exploration Mode, and it even mentions this is the way that “Assassin’s Creed Odyssey is meant to be played.” In Exploration Mode, markers don’t magically appear. You have to find where to go by investigating, gathering clues, and running around to explore. If a mission sends you to find a specific house in Greater Athens, you will need to ask around to get clues where the house might be. If you don’t like it, you can always switch to Guided Mode. The Exploration Mode presents a whole new way to play and think about the game. Practically everything you do depends upon exploration and investigation, especially when trying to find the members of that underground organization. Does it take longer to do simple missions? Absolutely. Do you get more out of it than the same old method of go here, do that? Definitely. I really felt immersed in Kassandra’s Ancient Greece, and as a result, I learned my way around the cities so much better than I have in past games. Of course it also means that I run into restricted areas more often than I mean to. The people inside don’t like it. They usually respond with arrows. Exploring means more than running around Greece. These are called the Grecian islands for a reason, and that means you get to sail. A lot. But if you hated the sailing in Assassin’s Creed III like I did (it’s why I avoided Black Flag), you’re in luck, because they’ve completely overhauled the sailing system since then. Sailing is pretty much a breeze, but things get dicey when pirates decide they don’t take too kindly to your kind there. If you hate the sea battles, it is possible to flee them. I have to say you shouldn’t knock it until you try it, because even I had a blast tearing these ships apart. Two words why: Ramming. Speed. There is even a trophy called Ramming Speed when you cut a ship in half by ramming it. I’ve never felt so much like Ben Hur in all my life. You may have heard that there is a bit of a war going on across Greece. Kassandra can’t go anywhere without running into Athenian and Spartan soldiers. Sometimes she’ll work with them. Sometimes she’s out to kill them and loot their forts (hey, you have to in order to clear Locations). Sometimes they want to kill you because you accidentally wandered into some rich guy’s house. It’s a rather complicated relationship than never really clears up. You can choose to actively participate in their battles, or remain perfectly neutral. Each region in Greece is either controlled by Athens or Sparta, but you can turn the tables on the controlling faction. 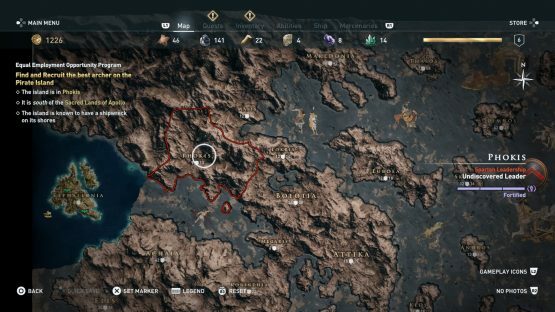 In each region, there are things Kassandra can do to weaken the region’s leadership, such as burning supplies, stealing their treasuries, and killing soldiers. If she weakens it enough, the people will abandon their leader, leaving him ripe for the assassinating. At that point, Kassandra can participate in a Conquest Battle, either defending it or invading it. Invading it unlocks greater rewards than defending, although defending is easier. It is possible to overrun most of your world map with either Athenian or Spartan control. My Kassandra remained fairly neutral and only took part in the Conquests when it benefited her personally. The Conquest Battles are nearly a battle royale of their own against enemy AI. Even though Kassandra is a mercenary, she’s out there on the field, fighting with all of the soldiers. Combat already requires some finesse out in the open world, but you really have to be on top of your game in these fights. They’re chaotic, and oh, people don’t wait their turn to fight you. One wrong dodge roll can suddenly nab the attention of five soldiers at once, and that is no picnic to get out of. This isn’t like the days of Ezio where you had potion pouches to stay in the fight. Taking on that many attackers at once is practically an assured desynchronization screen. As such, it’s prudent to have both your warrior skills and sneaking skills up to speed. There are many combat situations you can’t get out of, but before you have to get to hand-to-hand combat, it’s best to have your Assassination and Hunter skill trees filled out so you can silently take out as many soldiers as possible. The AI still isn’t perfect, although they do get downright aggressive with bat-like hearing in harder modes, but they do have some improvements. For example, shooting an arrow at one soldier will get others to find cover instead of pouring out to find what’s going on. I wish they would, because it would make picking them off easier, especially since getting one-hit kills with the bow isn’t as easy as it used to be. It’s difficult to get solid assassinations before upgrading your Assassination skills, too, especially when fighting soldiers at your level or higher. Thankfully, though, Kassandra has a few tricks up her arm guards to take care of pesky enemies. As with every RPG, a bit of grind is involved to move along in Assassin’s Creed Odyssey. If I was playing the game on my own, I would have loved this. Playing on a time crunch, however, really ground my gears. I’ve mentioned how the game really wants you to explore Ancient Greece and not just play it, and Ubisoft re-emphasizes that with the level requirements. It is not possible to crit-path this game (only do the main quests), because you’ll never reach the levels you need to progress. Playing on easier modes will help, but it still won’t be enough. I can’t tell you how many times I’ve started a main quest at one level, and the second or third part of it requires two levels above where I am. You’re meant to explore this game, dammit, and Ubisoft is going to make you, whether you want to or not. Fortunately, there are plenty of sidequests and other tasks that can help with leveling. Simply exploring a region nets you XP, as well as clearing out Locations. You can go take out a few pirates or maybe clean out bandit camps. Greece has plenty of caves, both above and below water, to explore. Why not go hunting? It’s always fun to shoot fire arrows at bears, right? Or hey, you’re a mercenary, why not go take on bounties from bounty sponsors? Or hunt down other mercenaries? Or maybe kill bounty sponsors so they can’t put a bounty on your head (they will for stealing and murder, the petty bastards). Completionists won’t think twice about grinding, because chances are they’ll do it all regardless. If you’re pressed for time, though, just keep that in mind, because no one escapes the grind. 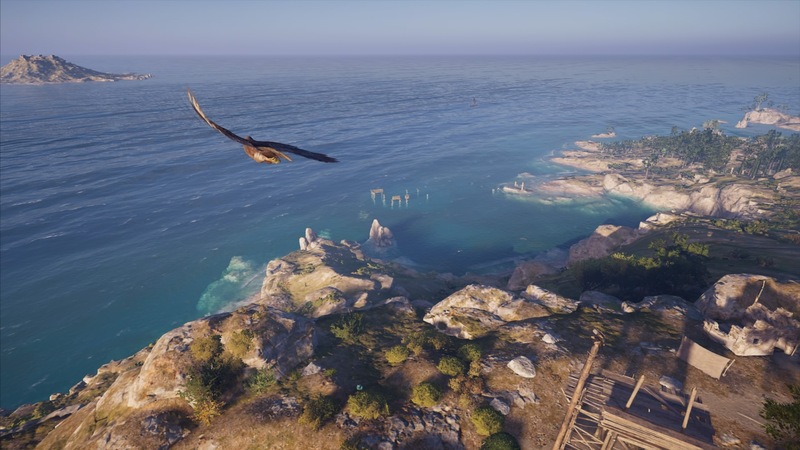 Ubisoft set out to create an Assassin’s Creed game worthy of Odysseus’ name, and bravo, the developer has done it. It’s certainly as long as one of Homer’s poems, but every minute of it is entertaining and, well, fun. It never gets old Sparta-kicking an enemy off a cliff. Clearing out Locations is always satisfying, especially when they require setting things on fire. Talking to Sokrates will make you question everything about your life and the game itself. Some of the choices you make will have a similar effect. You can’t come away from Odyssey without feeling like you were actively part of that great journey, from the highs to the lows and all of the incredible twists and turns in between. This is a voyage you don’t want to miss. 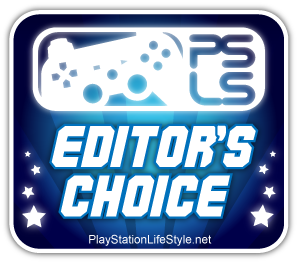 Assassin’s Creed Odyssey review code provided by publisher. Version 1.02 reviewed on a standard PS4. For more information on scoring please see our Review Policy here.